Colouring with Distress Inks may be something that you haven't considered, but if you make cards regularly then the chances are that you have a collection of these wonderful products. These inks can be used to create all wondrous kinds of effects on your cards, from inked edges, spattered skies, vintage effects and for creating your own style of backing papers. Many people don't realise just how versatile these inks can be and that they make an excellent medium for water colouring your images. I am using ink pads in this video. 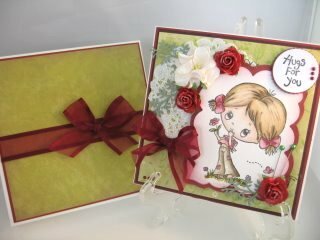 They are from the "Tim Holtz" selection from Ranger, and the result is soft and gentle. You will need a good quality brush but as I explain in the video it does not need to be expensive. I bought mine for 50p from an artist supply shop and so I bought 6 to keep me going. It is a Sable Hair brush and if you look after them they will last a long time. 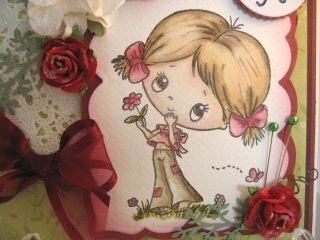 The card I am using is a Water Colour card from Crafters Companion and the result is excellent. It is a good, but inexpensive card and buy a small amount first till you know if you like this way of working. But my best advice to you would be to enjoy the process and relax as you play. Colouring with Distress Inks is a lovely way to play and the results can be amazing when you get the hang of it. Just practise and remember that a little of the ink goes a long way and you can leave it on your pallette to dry then reactivate it with a little water the next time you want to paint.